Found in marine, brackish and freshwater environments all over the northern Hemisphere, the Sticklebacks are feisty, colorful at times, and always interesting behavioral subjects. Five genera, seven species. 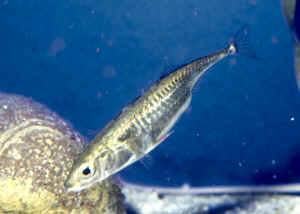 Gasterosteus aculeatus Linnaeus 1758, the Three-Spined Stickleback. A marine to freshwater fish... North Pacific; Baja to Japan. Aquarium photo (Monterey). Baugh, Tom 1985. The Sticklebacks, nature's spiny wonders. FAMA 7/85. Bell, Michael A. 1982. Fossil Sticklebacks and the pace of evolution. TFH 11/82. Goldstein, Robert J. 1995. The Sticklebacks. A most interesting freshwater species- and a native, too. Goldstein, Robert J. 2000. 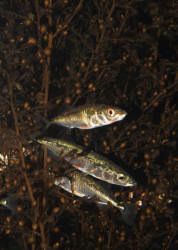 The Sticklebacks, Family Gasterosteidae. FAMA 2/00. Kenney, William R. 1988. 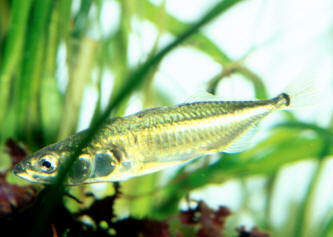 Everything you always want to know about Sticklebacks... and probably a good deal more. FAMA 3/88. Quinn, John R. 1976. I like Sticklebacks! Marine Aquarist 7:5, 76.